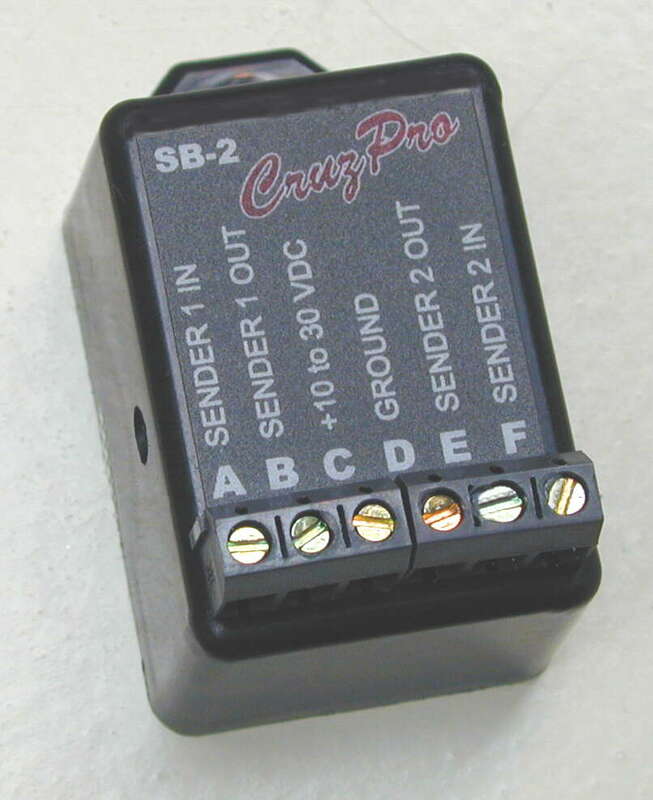 CruzPro SB2 Sender Buffer for two senders. CruzPro SB-2 Dual Sender Buffer enables you to add up to two CruzPro digital gauges to your existing analog gauge setup and still use your existing senders. 10.5 to 33.0 VDC 0.005 amps max. Two screwdriver adjustments. One adjustment for each of the two senders to make your analog gauge read correctly. Note: While the CruzPro digital gauge will still work at its optimal accuracy, the sender buffer does not improve the accuracy of your analog gauge. The SB2 sender buffer connects to your existing 10 to 180 ohm or 240 to 33 ohm single station sender (oil pressure, water temperature, fuel, etc.) and buffers the sender so you can connect a CruzPro digital gauge and still retain your existing analog gauge. The SB2 contains two complete sender buffers which can buffer two separate senders (for example, one oil pressure sender and one engine temperatue sender). Each of the two sender buffers in the SB2 has a small adjustment potentiometer that is used to make your analog gauge read correctly. Please note that while the CruzPro digital gauge will work at its optimal accuracy, the sender buffer does not improve the accuracy of your existing analog gauge. The sender buffer is powered by 12 or 24VDC and draws less than 0.005 amps.